After numerous restores, endless backups, and frustrating reconfiguration of my favorite apps I have finally arrived to the root of the problem and the solution. First, just to make clear, I would like to point out the various things I have tried over the past week or so as surely you have tried some if not all yourself. Each of these had varying levels of success but ultimately I encountered errors either when upgrading an app or simply launching it later on. The root of the problem seems to be the way iTunes 7.7.1 applies the digital rights management to the apps. iTunes does this to ensure the app only runs on authorized computers similar to how the music you purchase is also limited to authorized computers. The problem stems from some failure in the way iTunes 7.7.1 applies this signature to the apps. Further complicating matters are apps purchased through the App Store icon on the phone. Theory states these apps will sync up to your computer automatically since they were purchased through the same account. These apps many times didn't transfer over transparently -- identifying again some issue with the digital rights management applied to the application files. The solution is quite simple! Simply downgrade to iTunes 7.7 and use that version until the next release is issued by Apple (expected in September as per some other blogs). I had a heck of a time finding 7.7 and even initially thought Apple themselves downgraded to 7.7 because their site reflects iTunes 7.7. After downloading from their site however, it clearly states 7.7.1 in the title bar so another source must be found. Simply drag the iTunes application into the trash. Don't worry none of your preferences are erased. Rerun the 7.7 installer and you are done. Uninstall iTunes and reinstall the following one. 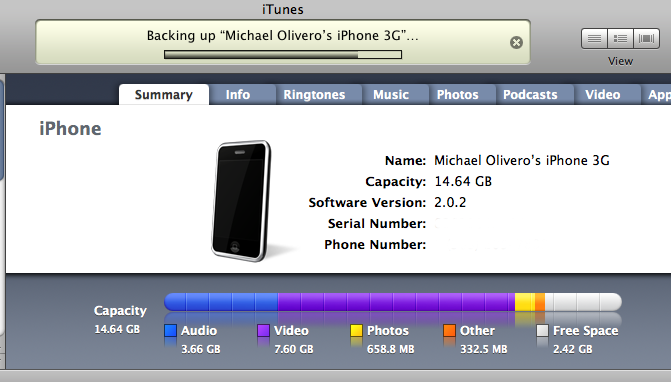 The iPhone 2.0.2 update does indeed help matters with the 3G connection. Now I waited almost a week since the update to report on my blog because I wanted to have ample time to test and review the results. As we all know, the update improved responsiveness of the phone in many areas such as the keyboard and contacts. The one item most people have been waiting roe though is the improved 3G connectivity. My findings indicate the switching to edge randomly has decreased quite a bit. It has not been eliminated only because I noticed it on edge the other day at the AT&T store but this was the only time I noticed. Previous to the update I would notice through my speakers as the speakers would make the infamous GSM noise - indicating it as on the edge network at the time. Since the update the speakers never made noise again! While at the AT&T store I mentioned the edge connection to a salesman and h pulled his 3G phone ( non iPhone ) and he also had edge at that time too! 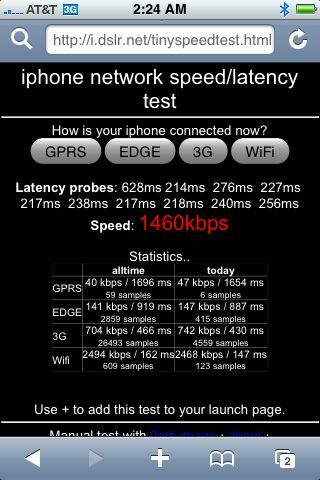 Great news for me as I felt the iPhone was simply doing what any other 3G phone would do. I rarely have dropped calls and for some reason when I visited my parents on Saturday I had notorious amounts of dropped calls and no data connection. -- at least it wouldn't bring down the mail or web page when trying to. This brought my spirits down quite a bit as now my phone was acting up like many of the iPhones talked about online. Interestingly enough when I left my parents house everything went back to normal. Keep in mine also I had almost a full 3G signal at my Dad's house. Curious if this was an isolated incident I decided to drive by my dad's neighborhood the following day and attempt making calls and low and behind I was dropping like crazy again. Initially I believed AT&T was resetting their network or something to that effect the night before. This time however it was too coincidental the calls were dropping again in the same vicinity. My take so far is we have some areas of AT&T network which are not iPhone friendly for some reason and those in that area are mostly being affected. I just upgraded my iPhone to firmware 2.0.2 and decided to conduct some tests. This website conducts some latency tests and then does a bandwidth test right afterwards. I feel this test is more valid than say the speed test within the app store because there are delays with DNS resolution and transfer start up times which unfortunately are included in the timing. While I agree the speed test app in the app store may represent real world scenarios, it does not measure nor report brute download capacity accurately. I did find this website with a casual google lookup and I am in awe with the repeated results with a poor 3G signal. See for yourself: No matter how many times I try (in this case three) I find it difficult to match the brute timing above with the free speed test app in the app store. See for your self: UPDATE 8/20: Just to not create the wrong expectations, the speed I was obtaining was at 2:30am when surely there was very little traffic on the 3G network. All throughout the day I was obtaining values from 400k-800k. 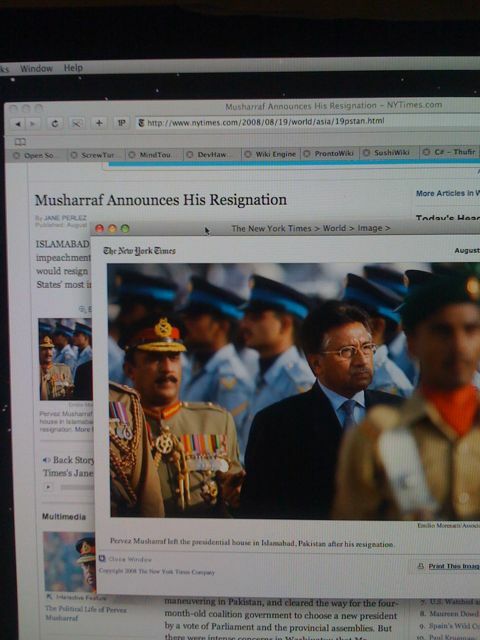 Today Musharraf, in a nationally televised address, resigned. Democracy prevails in pressuring those who exercise control over the will of the people. Every year we reach the sad moment where we say farewell to our interns. 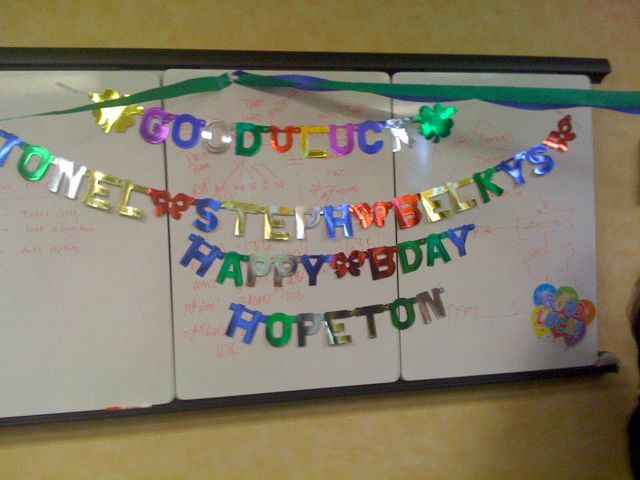 This is a farewell party we threw this year for them. 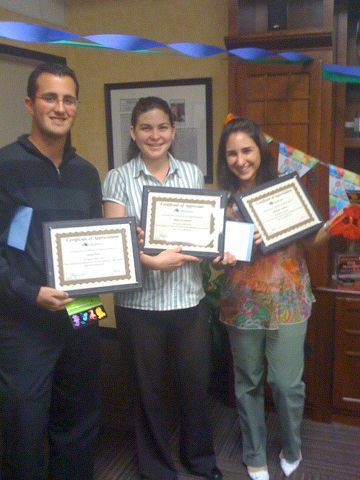 Each recieved a plaque containing a certificate of appreciation for all their hard work. 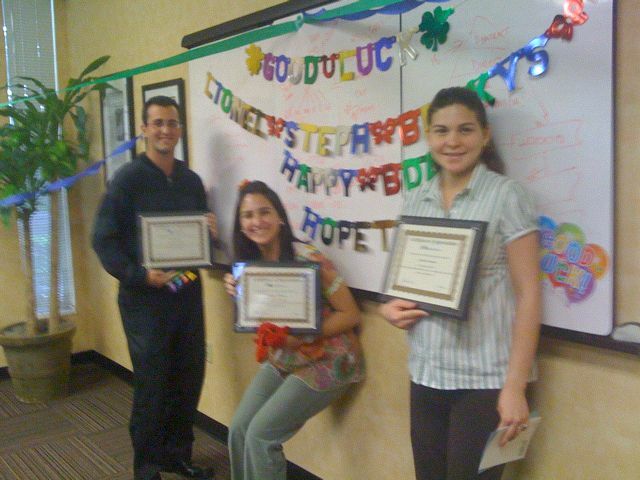 In the first picture from left to right are: Lionel Perez, Stephanie Tamargo, and Belkys Fernandez. One of the best games for the iPhone is now available -- and it's FREE! 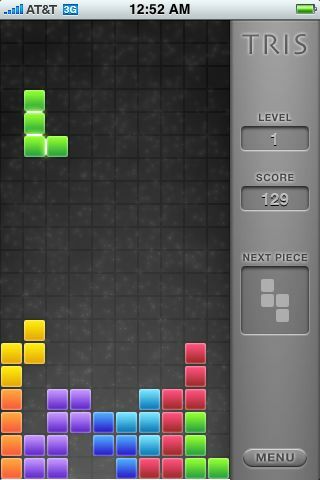 I normally do not play games much nor was I ever a crazy tetris fan, but this native application by far exceeds all expectations for an iPhone game. The game has excellent animation by having the pieces smoothly move down for each descending step. The most impresive feature though is the touch interface along with the smooth animation. Everyone who I have shown Tris to instantly said "wow" when the first moved a piece with their finger. A unique feature of the finger interface is the ability to move the piece up again. You might say, "hey wait a minute that's not allowed in Tetris". But indeed you can though. At first I thought this was a simple one time helper feature because I was not able to move the pieces up consistently. In the end though it turns out I can move each piece up -- but only if I accelerated it by moving it down with my touch first. In other words you can move the piece up only as far as it would normally be if you hadn't accelerated it down. I really recommend the game and I easilly give it a full five stars! Search for Tris in the app store to download it. 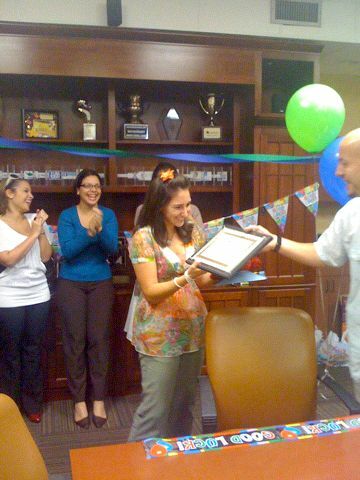 At Inktel we usually give surprise birthdays from time to time where many members of our company gather secretly in the large conference room and then someone lures the birthday person with some bait. This time around I had my iPhone with me and decided to snap a few. 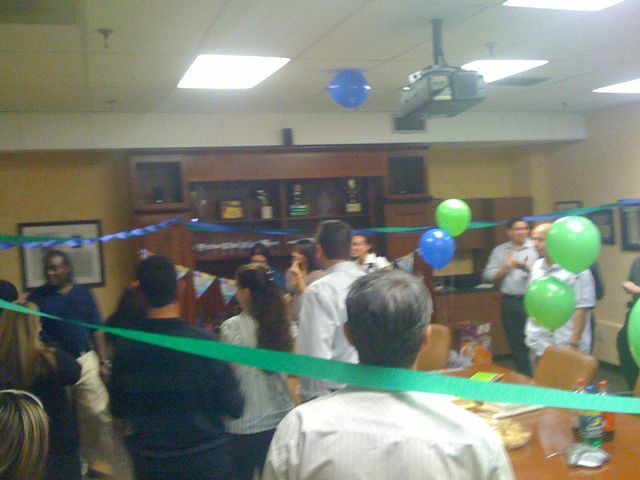 The birthday person this time around was Luis Gonzalez, VP of call center operations. 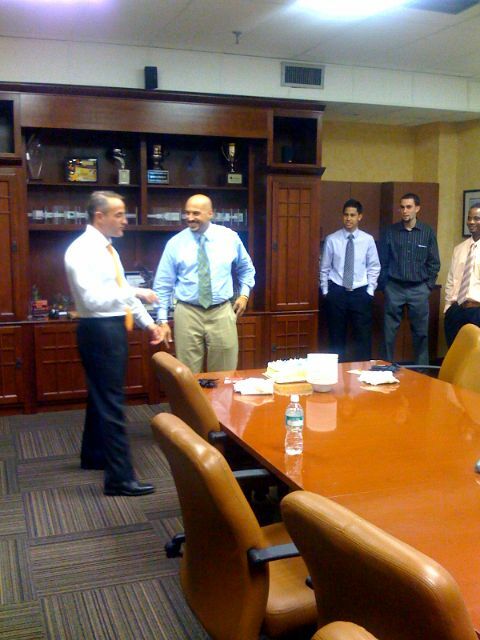 Ricky Arriola, our president had the honors of luring him to the conference room with an impromptu meeting. These pictures were snapped moments after the candle blowout.